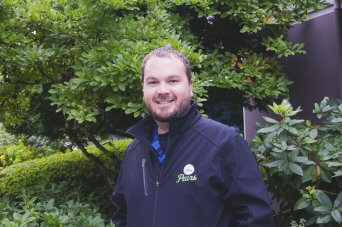 PORTLAND, Ore. – October 10, 2017 – Pear Bureau Northwest is pleased to announce that Neil Ferguson has joined the company as Communications Specialist. Ferguson brings a wide range of experience in communications, social media management, content strategy and journalism to the Pear Bureau Northwest team. Most recently, he handled an array of editorial and marketing responsibilities as Media Content Developer for Coroflot, a respected site aimed at connecting creatives with professional opportunities. Over the past eight years he has also established a reputation as a creative and reliable freelance journalist and editor, among other creative endeavors. His unique cross-section of professional experience comes from working in diverse industries and always pursuing new ideas and best practices. “Joining the Pear Bureau is an exciting opportunity because I can combine my skills with a passion for food and eating well. As consumer awareness continues to move towards healthy eating and fresh produce, I feel like now is the ideal time to play a role in guiding people towards making educated choices and feeling passionate about what they eat. The Pear Bureau’s programs have been benefiting growers and consumers for over 85 years, and I feel honored to join such an established, respected organization,” said Ferguson. Ferguson earned a B.A. in English and Communications from the University of Texas at Austin. He lives in Portland, Ore., where he can explore the beautiful state on his bicycle, see live music, and discover new culinary experiences. Pear Bureau Northwest is a non-profit marketing organization established in 1931 to promote the fresh USA Pears grown in Washington and Oregon, home to 87% of the US commercial fresh pear crop. The Bureau represents 900 grower families and partners with outlets throughout the world in an effort to increase overall success with the pear category. The organization provides marketing and merchandising expertise that is customized specifically for each retail organization, using its pear consumer research findings as well as individual store analysis using an in-house data system that measures pear category performance nationwide and third-party research to show retailers how they perform versus their competition. Retailers who are interested in partnering with Pear Bureau Northwest should contact them at info@usapears.com or 1 (800) 547-4610, as well as visit the Trade.USAPears.org website.